So said Ferdinand I, Emperor of the Holy Roman Empire in the 16th Century. And, so does myMEGusta, and just about everyone else in the world. There is an old Japanese proverb: Luck is like having a rice dumpling fly into your mouth. 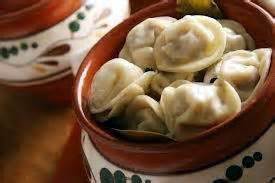 Dumplings range from ravioli to the doughy treats that come in chicken stews (“chicken and dumplings”), to Polish pierogi to Eastern European kreplach to Russian pelmeni to German knoedel to sadza, the national dish of Zimbabwe. 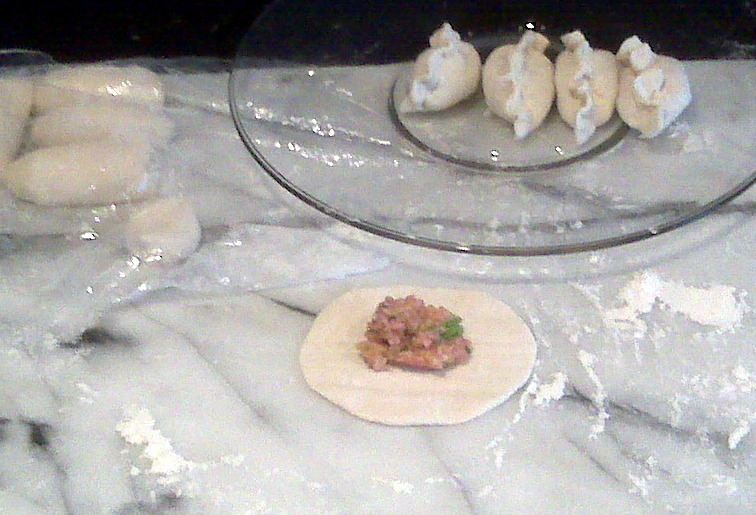 If you think about it, empanadas, those Latin American treats, are also a variation on the dough covered treat theme. Then there is the whole category of dessert dumplings. But today, we are in the mood to travel to the Far East and contemplate the delicious stuffed noodle skins that are the heart of dim sum brunches. 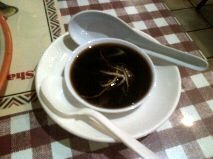 Many of us got introduced to the concept through the ubiquitous won ton soup of our youth (when chicken chow mein was considered “normal” Chinese food). Poor Old Ferdinand probably never enjoyed an Asian dumpling. He never got to savor a pork soup dumpling, made by stuffing the noodle with jelled or frozen broth and a little meat, so luscious that they are eaten from a spoon to catch the steamy juices as they spurt out when you bite in. Hint: Put on a few drops of Chinese vinegar/ginger for an extra tasty treat. His chefs never made classic Chinese Jao-Tse, aka Pot Stickers, the deceptively simple pork dumplings which can range from the humdrum to heavenly, depending on the care with which chef chooses quality ingredients. Ambitious readers should consult Eileen Yin-Fei Lo’s excellent Mastering the Art of Chinese Cooking (Chronicle Books) for step-by-step directions which worked fabulously in myMEGusta’s kitchen. 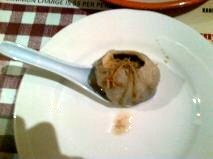 This type dumpling can be steamed or deep fried, but the tastiest results come from steam frying. 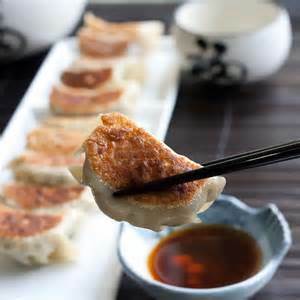 A little complicated, this involves cooking the dumplings in a mixture of oil and water, allowing the latter to evaporate as the steaming is completed, and letting the cooked dumplings crisp up in the remaining oil. Gyoza, a familiar appetizer in stateside Japanese restaurants, are a close relative. Another standard which can be either just OK or heavenly is the Har Gow, the essence of simplicity depending totally on the freshness of the shrimp and delicacy of the seasonings. Xian, China, famous for the terra cotta warriors, is also considered the dumpling capital of China, particularly due to one restaurant where all tourists “must” dine because they, supposedly, have the greatest variety in the world. Unfortunately, most of them sampled by myMEGusta were just gimmicky (fancy shapes and food colors), doughy and not particularly interesting to eat. What a shame to have wasted a meal on mediocrity with the vast array of wonderful dumplings out there! 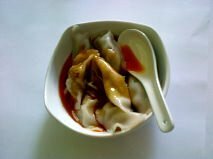 For really light steamed dumplings in a spicy sauce, seek out Szechuan places, particularly in cities like New York where authenticity rules. These cuties in a spicy red oil sauce are one of myMEGusta’s favorite appetizers in the world to share at the start of a feast. These Asian dumplings sound delicious. To what extent they can successfully compete with the dumplings of my childhood? Bread dumplings made from stale rolls were a staple to the extent that the Intercontinental Hotel in Vienna had a roll dicing machine. Sweet dumplings made with potato dough enrobing apricots or Italian plums in season were a much anticipated treat. There were also cottage cheese dumplings, covered with browned butter and poppy seeds. 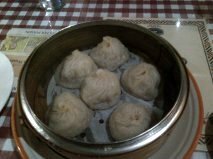 Memories, these dumpling are hard to find today on menus even in Vienna.